Nov 9 Meeting – Take Your Career Wherever You Want to Take It! Take Your Career Wherever You Want to Take It! **Free coffee and dessert for members attending the program only. Reservations: Call A. Soos (908) 604-2693 at or email rsvp@njaiche.org before 12 Noon Friday, November 5, 2010, for reservations. If you make a reservation and include a contact email/phone number, and the meeting is moved/postponed because of weather, we will notify you. Although we appreciate reservations in order to set up the tables, walk-ins are always accommodated. If you are undecided, please feel free to just drop in. Anthony Fasano AKA Your Professional Partner, CEO and founder of Powerful Purpose Associates is a nationally recognized professional coach and inspirational speaker specializing in the areas of business and career growth and development as well as leadership. Anthony uses his highly effective coaching and speaking techniques to help professionals work through blocks, prioritize effectively, set clear goals and achieve their maximum potential. In addition to his coaching and speaking credentials, Anthony is also an author. He is a contributing author of the soon to be published book entitled The Coach’s Journey as well as the author of the popular Daily Boost From Your Professional Partner TM which is a daily e-mail that goes out to thousands of professionals worldwide Monday through Friday. This is a free email service with the intent of helping professionals stay focused and inspired in their career and leadership endeavors. Anthony received a B.S. and a M.S. in Civil Engineering from Lafayette College and Columbia University respectively and his coaching certificate from the Institute of Professional Excellence in Coaching. Received in 2005, the Young Engineer of the Year Award from the New York State Society of Professional Engineers, Rockland County Chapter. Was selected in 2008, by Rockland County, New York to participate in the Leadership Rockland program, a 12-month leadership development program in which participants receive leadership training from local politicians, economists, historians, artists and other professionals. Was selected in 2009, to receive the “Forty under 40” Award from the Rockland County Economic Development Corporation which recognizes the most promising up-and-coming young members of the Rockland County business community. The award is based on professional and entrepreneurial accomplishments, community involvement, and the nominee’s positive impact on the local community. Received in 2010, a Presidential Citation from the New York State Society of Professional Engineers for his dedication to both the Society as well as the engineering community. Is a licensed Professional Engineer and a LEED Accredited Professional. Is a past Chairperson and Founder of the American Society of Civil Engineers Lower Hudson Valley Younger Member Group. Is currently the acting President of the National Society of Professional Engineers, Rockland Chapter (NY). Is an industry-recognized inspirational platform speaker on the topics of career advancement, business growth and development and leadership. Engineering companies and projects can be very demanding to industry professionals. Engineers often work long hours and are faced with stressful challenges and decisions. Often times, engineers are so involved in their job that they fail to advance their career. They become so technically focused that they neglect to develop their soft skills such as networking, communication and leadership skills. This is detrimental to both engineers and their organizations. This seminar is designed to remind engineers that they own their career and it is up to them to take their career wherever they want to take it! Attendees will be reminded that it is their responsibility to take the initiative to develop their careers and take advantage of every opportunity available. At the end of the seminar, participants will be aware of the importance of these six points to their career success. They will also have information that they can take and immediately implement into their career to improve these 6 points and start to take their career wherever they want to take it! Join us for an interesting evening! Directions: 287 South to Exit 17. Merger onto US-202 S/US-206S towards US-22W/Somerville/Flemington. Merge onto US-22W. Make Left on County Line. Make 1st Left onto Meister Ave.
Mark Smith, Machine Vision Specialist, Axis, Inc.
Bill Kantor, Business Development Manager, Cognex Inc.
Reservations : Call Andy Soos at (908) 604-2693 or e-mail at rsvp@njaiche.org by Friday 10/08/10. Our annual College bowl brings together student teams from area schools’ Chemistry/Chemical Engineering Departments. Each team includes three students and two alternates, but other students are invited to attend. Questions are selected at random from a preselected list of Engineering, Chemistry and Physics questions with time limits for each team’s answer. There will be several rounds of questions. Answers are judged by a panel of engineer-judges not affiliated with any of the participating schools. The panel will grade the responses on a scale of 1 to 5, with 5 being the “perfect” answer. In the case of a tie, the moderator’s score will be selected to break the tie. Cash prizes ranging from $300 (1st place) to $100 (4th place) will be awarded based on total scores. 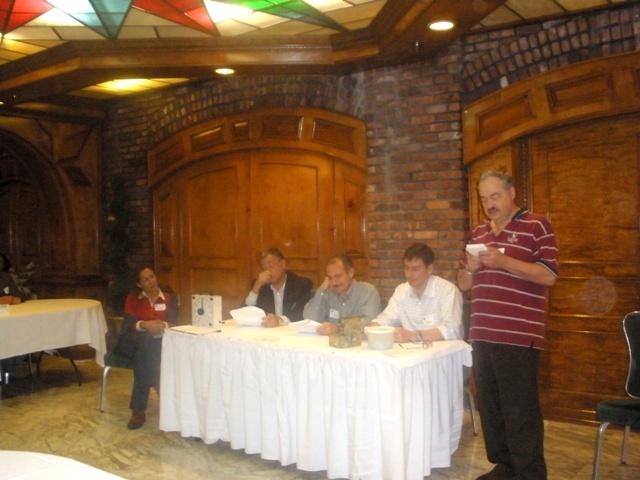 The next executive meeting will be held at Paisano’s Pizza on Tuesday, October 5, 2010. Everyone is invited so please feel free to attend. Route 22 West : (Scotch Plains, Berkeley Heights, Fanwood, New Providence Exit) – At the exit, make a right turn. At the traffic light, make a left turn and take the overpass over Route 22. At the end of the overpass, make a right onto Park Avenue. Snuffy’s will be on the right. Garden State Parkway : (North and South) – Take Exit 140 from the Garden State Parkway and follow the signs for Route 22 West. Once on Route 22 West, follow the directions above. Route 78 : (East and West) – Take Exit 41 from Route 78. Follow the signs to Scotch Plains. This will put you onto Plainfield Avenue. Follow Plainfield Avenue straight through the traffic light, where it becomes Bonnie Burn Road. Follow Bonnie Burn Road to the next traffic light and make a right turn. Follow the overpass over Route 22. At the end of the overpass, make a right onto Park Avenue. Snuffy’s will be on the right. New Jersey Turnpike : (North and South) – Take Exit 14 from the New Jersey Turnpike and follow the signs to Route 78 West. Once on Route 78 West, follow the directions above. Route 22 East : (Light at Wal-Mart, Watchung) – Take the jughandle at the light into Watchung Square Mall. Drive up past Wal-Mart and Paisano’s is to the right of Borders. Route 22 West : (2 nd Light for Watchung Square Mall) – This is just past the Mall and Wal-Mart is just west. At the light, make a right turn into Watchung Square Mall. Drive up past Wal-Mart and Paisano’s is to the right of Borders. Route 78 : (East and West) – Take Exit 40 from Route 78 (Gillette/Watchung). Head South onto Hillcrest Road (South is a right turn if you are Eastbound, and a left turn if you are Westbound). At the bottom of Hillcrest road, make a right on Valley Road. You will enter the Watchung Circle. Travel ¾ of the way around the Circle and take the exit after the Watchung Municipal Building toward Route 22. Make a left one block before Route 22 to go over it and take Route 22 East. Once on Route 22 East, follow the directions above.